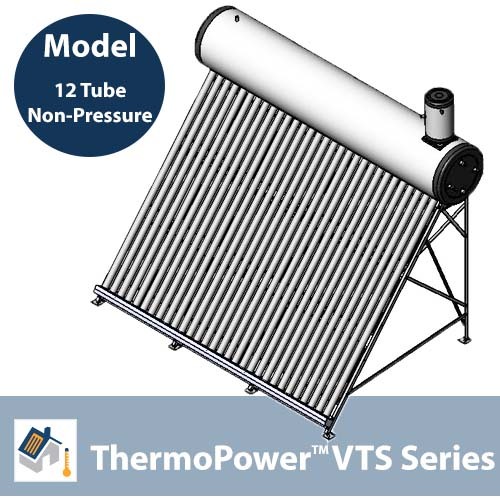 SKU: ThermoPower-VTS-NP12. Category: Thermosyphon Solar Hot Water. home using the best engineering practices available word-wide. All thermosyphons are plug and play solar-hot water solutions, designed with ease of installation in mind. The collectors are included in our prepackaged kits. Why? Because the thermosyphon system is an all-in-one plug and play system, the collector and mounting do in fact come with the system. Each ThermoPower thermosyphon has a different number of evacuated tubes to meet a wide variety of hot water needs.